We stock LOADS of different suspension forks from Rockshox. Here’s a handy guide to help you whittle them all down to a manageable shortlist. We’re a big seller of RockShox forks. At any one time we typically have more than 50(!) different RockShox models listed. With this many variations of a brand’s product we thought it could do with a buyers guide of its own. This guide is not intended as a compatibility guide ie. what forks will physically fit your bike. Read our previous suspension fork buyers guide for that info. This guide is about what sort of rider should buy what RockShox fork. Out of the 50+ models there’s 12 different model types. We can ignore the Bluto and Boxxer forks for now (they’re for Fatbike and Downhill bikes respectively). This leaves us with the following 10 models: 30/XC30/XC32, Argyle, Lyrik, Pike, Reba, Recon, Revelation, Sektor, SID and Yari. 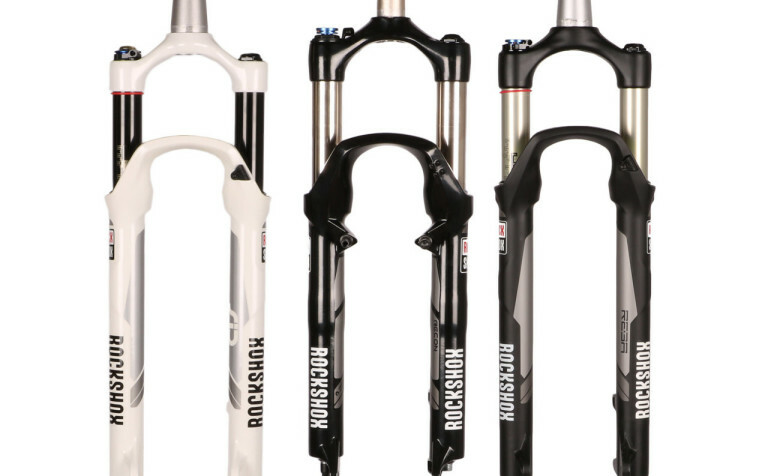 Some RockShox models are ‘cut price versions’ of other forks. A Recon is a cut price Reba. A Sektor is cut price Revelation. A Yari is a cut price Pike. So that actually leaves us with ‘just’ 7 different types of fork to explain. Let’s take each of these fork types individually and describe how they differ and list what sort of rider they’re intended for. A budget-minded fork. Steel stanchions (heavier than the usual aluminium). Usually coil sprung (as opposed to lighter air sprung forks). Available in short-to-mid length amounts of travel (80mm, 100mm or 120mm). Some models have mounts for rim brakes as well as disc brakes. Who it’s for: budget-minded casual riders. A heavy duty fork. Overbuilt for abuse. Has a damping circuit biased towards big hits and landings. Principally designed for dirt jump riding but can be a good choice for heavy-hitting riders. Who it’s for: hard-hitting dirt jumpers. Long travel fork (170mm ish) with a single crown. 35mm stanchions. Designed for rough riding on bikes that are heavily biased towards performance on descents as opposed to climbs or contouring trails. With damping suited to aggro riding and repeated big hits. Lighter than a triple-clamp DH fork. Who it’s for: Downhillers on their day off. Longish travel forks (140mm, 150mm or 160mm). 35mm stanchions. Designed for trail and enduro riding. Stiff and strong enough to be ridden aggressively on rough terrain but not too hefty. Sophisticated damping circuit with good adjustability for varied terrain. A very popular sort of fork for modern full suspension trail bikes. Who it’s for: modern trail bike riders. Available in short-to-mid length amounts of travel (80mm, 100mm or 120mm). 32mm stanchions. Bolt-thru axle and QR versions. Tapered steerer and 1-1/8th. Not cheap but not expensive either. Lighter and with better damping than budget forks. Damping biased towards less-aggressive riding styles. Who it’s for: no-nonsense folk who just want to fit and forget. Pretty much longer travel versions (130mm, 140mm or 150mm) of the Reba and Recon. Tapered steerer or 1-1/8th but the come in bolt-thru axle guise only. Not cheap but not expensive either. Not quite as beefy or sophisticated damping as the newer Pike and Yari forks. Who it’s for: no-nonsense folk with longer travel bikes who just want to fit and forget. Lightweight forks. Mainly (only?) popular with XC riders and racers. A tad flexy for heavy or aggressive riders. Available in short-to-mid length amounts of travel (100mm or 120mm). Usually come with remote bar-mounted lockout switch. Damped for lighter rider weights. Surprisingly active when not locked out; very much ON/OFF forks. Once you’ve decided what sort of fork suits you best, it’s then time to look closer at the spec. Search for your desired fork type (ie. “Pike”) in the search box at the top of our suspension fork section. Is it the correct travel/steerer/axle for your bike? Are you bothered about having adjustable compression damping? Or adjustable Lockout threshold? Once you’ve done all of this you’ll be left with far fewer forks to choose from – probably just one or two actually. Leave a comment below and we’ll get back to you ASAP. Tagged argyle, buyers guide, enduro, front suspension, lyrik, mountain bike, mtb, pike, reba, recon, revelation, rockshox, sektor, sid, suspension, Suspension Fork, xc30, xc32, yari. Bookmark the permalink. Thanks for this brilliant explanation – so good to be able to get through all of the marketing guff and quickly get a good idea on what I should be looking for. RockShox should have a link to this article. Very well written making easy to select the kind of fork we want/need. I have a 2013 Niner Jet9 frame only that I am building from scratch. It came with a Recon 100mm travel originally from what I read. I raced MTB in high school which was 22 years ago so I have no clue on what to buy now! I know I want to stick with Rockshox. I race road and triathlons but wanted to get back to MTB. I am usually around 190-210lbs and read that I should go with a 120mm instead of 100mm. The local trails are mostly flat but mountain trails are within 3hrs. Budget is up to $800 max. Any thoughts??? Hi Corey – Check out the Rockshox Revelation RCT3 Solo Air – get great reviews. Looking for a new bike and has decided to do a real market analysis before shopping. This is exactly what I was looking for. Thank you. Now I will browse for similar article on Fox suspensions and various drive lines. Naturally starting at your blog. Hi Mark Recons would most likely be more suitable for general xc / trail riding & are a bit less weight too.